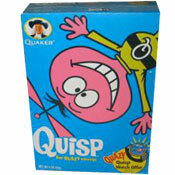 Which cereal's mascot disappeared from cereal boxes in 1985 leaving a question mark where his face should have been? This cereal was "made only from 100% whole wheat... nothing added... ready to serve." It was made by Sunshine Bakers. What do you think of Sunshine Shredded Wheat? 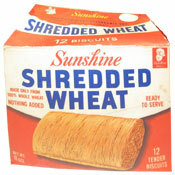 This was the unpretentious version of shredded wheat (as if Nabisco owned a copyright on the term "shredded wheat"!) Sunshine merged with Keebler and Keebler was bought by Kellogg's a few years ago. Kellogg's had its own shredded wheat many years ago (you can still get FROSTED mini-wheats). This is better. I like plain cereals. Loved them as a kid, many, many, many years ago. I have looked in all my grocery stores and those in surrounding towns... including natural food and health food stores and cannot find anywhere. Please don't tell me they no longer make this great cereal... the very best!